The Jeep Renegade is a perfect blend between Jeep styling and practicality, and blurs the lines between sport utility vehicles (SUV) and crossover utility vehicles (CUV). The 2016 Jeep Renegade comes in six trims , and one of the Renegade’s most equipped trims is the 2016 Jeep Renegade Trailhawk 4×4. The Jeep Renegade Trailhawk 4×4 comes standard with a 2.4-liter I4 180-horsepower MultiAir engine. The standard transmission is a 9-speed automatic transmission, which generates 175 lb-ft of torque. With this configuration the Jeep Renegade Trailhawk 4×4 has an average fuel economy of 21 MPG in the city and 29 MPG on the highway. 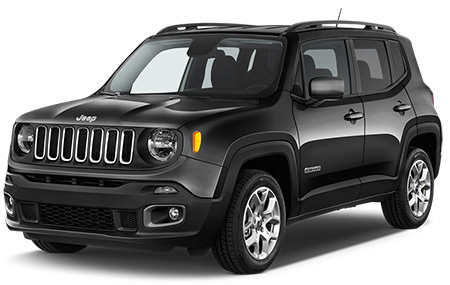 The 2016 Jeep Renegade Trailhawk has a roomy interior that comfortably sits up to five passengers. If driving solo, the front passenger seat can fold down to create more space for cargo or a work space; if driving with an empty rear seat, drivers can fold it down into a 60/40 split. Integrated into the dashboard is an Electronic Vehicle Information Center that displays current MPG, fuel usage, system status, and more. The entertainment system comes with voice command via Bluetooth, complete with Uconnect 5.0, a USB charging port, and an auxiliary port. UConnect 6.5 NAV is an option, and SiriusXM Satellite Radio comes standard with a 1-year subscription. The Jeep Renegade Trailhawk 4×4 rides on 17-inch rims that are fitted with all-terrain tires. In case of emergencies, a full-size spare tire is included with the vehicle. Buyers can opt to add My Sky Fixed removable or My Sky Power retractable/ removable panels . For varying weather and lighting conditions, the headlamps are automatic, the rear window has a defroster and the side exterior mirrors feature a heating element. Buyers have a choice of ten colors to finish the look of their Jeep Renegade. Packed with safety features, the Jeep Renegade Trailhawk 4×4 is fitted with all kinds of airbags in the front, side and rear. The vehicle also comes with the current panic brake assist/forward collision warning system to avoid foreseeable accidents. Anti-lock 4-wheel disc brakes are equipped to help prevent wheel lockup and loss of traction. Remote keyless entry and remote start up are add-on options. The Renegade Trailhawk has an MSRP of $26,745, an affordable price for a crossover that is equipped with many great features. It is backed by a 3-year or 36,000-mile basic limited warranty, a 5-year or 60,000-mile limited powertrain warranty, and roadside assistance for 5 years or 100,000 miles. In addition, it has battery rundown protection, ensuring the vehicle battery won’t drain completely, even if an electronic is drawing power while the vehicle is off. Where to get a 2016 Jeep Renegade Trailhawk 4×4? The Aventura Chrysler Jeep Dodge Ram dealership is located in North Miami, and has many new cars as well as used vehicles. Stop by to see what we have in stock, or check our online inventory today.